A removal van pulls into the street accompanied by the Neighbours theme tune. Max and Danny Ramsay watches it approach and pull up outside No.22. Lucy Robinson sees it too. Lucy rushes in and tells Jim and Helen that the new neighbours have arrived. 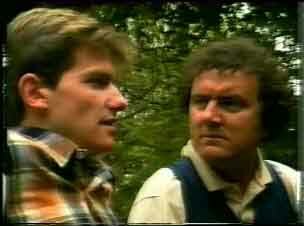 Meanwhile, Max Ramsay is interrogating the removal man but he won't tell Max anything about the new neighbours. Max says he hopes the new neighbours haven't got a dog. DANNY: She didn't kill him. She only shot him. REMOVAL MAN: Oh. She killed her lover, didn't she? And hey, there's a blonde stripper around here who was charged with murder. Sounds a bit saucy to me. MAX: For someone who sees all and says nothing, you've got a big mouth, mate! REMOVAL MAN: Only what I read in the newspapers...mate. Just then, Max and Danny see Paul getting out of a taxi. LUCY:(excitedly) Dad, Dad! Paul's home! He puts down his paint pot (for he and Helen are decorating the living room). HELEN: He's said he'd be there another week! JIM: I wonder what went wrong. Max and Danny go over to greet Paul. He's in a foul mood and resists their attempts to help him with his briefcase. PAUL: I'm not a flaming invalid, Danny! DANNY: No need to bite my head off. Paul stalks off towards the Robinson house. Lucy runs out and hugs him. DANNY: How come you're back so early, Paul? You're not supposed to be back for another week. PAUL:(irritably) I was in a convalescent home...not a jail! MAX:(quietly, to Danny) Just as well his old man warned us he'd changed so much. Jim and Helen greet Paul. He's discharged himself against the doctor's advice, insisting that he's well. PAUL: And while we're all together, I never want any mention of her or that marriage again. As far as I'm concerned, it never happened. She's dead. LUCY: But she isn't dead! PAUL: Well, she is to me, alright? He stalks off to his room. Shane is standing by his car outside the airport. A woman runs over and kisses him. WOMAN: Joey? Joey? I can't believe it! She kisses him again. Shane fends the woman off and tells her she's got the wrong man - he's never seen her before in my life. WOMAN: But we met in Tassie, don't you remember?! The woman gets a bit embarrassed and tell him they look identical. She runs off and gets into a cab. A woman reaches the bottom of the escalator. SHANE: Aunty Madge? Hi, remember me? - Shane. MADGE: Shane! Good lord - so you are. Shane explains that he's working as a chauffeur - that's why he's dressed in a suit. SHANE: I thought you were coming in on an earlier flight? MADGE: Well I was, until I realised how dear they were, so I went down to the airport at six o'clock and came stand-by! A long-suffering porter puts five bags into the boot of the car(!). When Shane goes to tip him, he finds his wallet is gone. We cut to the woman from earlier sitting in the back of her taxi, looking through Shane's wallet - she's pickpocketed it! Shane has reported his lost wallet to the police. Madge is ranting about his losing a whole's week's wages to a girl. SHANE: Where can I drop you off Aunty Madge? SHANE: Yes, where are you staying? 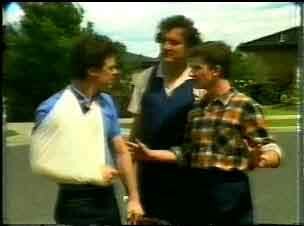 MADGE: I'm staying in Ramsay Street, where else would I be staying? MADGE: Of course with you, I explained that on the telephone. Madge goes on to say how worried she's been about his family since Maria left. MADGE: To think I had to hear from strangers about her walking out on your father! Madge says she wasn't really surprised - she never thought the marriage would work. Shane is annoyed and said the marriage worked for over 20 years! MADGE: It was doomed from the day he proposed. A beautiful young girl like that...and your father. Well, let's face it, anyone would have to be a saint to put up with him! Shane is even more annoyed. Madge says she's not going to pretend to get on with her brother when she doesn't - she hasn't even seen him for five years. MADGE: Max, you'd think after all these years you could at least be civil! MAX:(angrily, to Shane) You said you'd collect her from the airport and drop her off at a motel somewhere! MADGE: It's not Shane's fault, I told him to bring me here. Shane is in a bad mood and tells Max about his wallet being stolen. DANNY: Would you like a cup of tea, Aunty Madge? MAX: Like hell, she will! MADGE: Thank you, Danny, milk, no sugar, but none of that weak stuff! Madge tells Max that she's worried - she's just heard about Maria leaving and then about Paul being shot by his wife! MAX: That's none of your business! MADGE: Oh, isn't it? 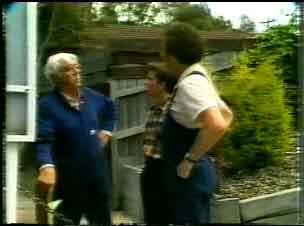 Ramsay Street was named after my grandfather, remember? MADGE: Oh and a fine state you've allowed this street to slide into. Murder, divorce and God knows what else! He'll be turning in his grave! MAX: Which won't be easy seeing you cremated him! Shane decides to go back to work. MADGE: Would you two boys bring my luggage in please? MAX: No way! No way are you staying in this house! MADGE: You can rant and rave all you like, Max, I'm staying! Max opens the door, saying he'll take Madge to a hotel himself. MADGE: Max, I think you're forgetting something. I know where the body's buried. Max thinks about this and then stomps off to his bedroom. Madge starts making herself at home! The removal man is still unloading things from the van. Danny has made Madge a cup of tea. She takes a sip and grimaces. MADGE: No, dear, but don't worry! Danny asks Madge what she meant before about "the body". Madge says all families have secrets and her father wouldn't want anyone to know this one. Danny gets upset, thinking she's talking about his paternity. Max comes out of his bedroom. DANNY: You've told her about me, haven't you?! MADGE: About you? What about you? But Danny was walked out of the back door. MADGE: What's he talking about? MAX: You're nothing but trouble, Madge. Shane sees the woman who pickpocketed walking down the street. He chases after her. SHANE: So, we meet again. The woman tries to get away, but Shane tells her he wants his $300 back. The woman proclaims her innocence vigourously and Shane is forced to back down. SHANE: I just never want to see you again, OK? WOMAN: Well, I don't want to see you again, either! Danny is sitting in the garden, upset. Max comes out to sit with him. DANNY: Why did you tell her, Dad? You said, as far as everyone was concerned, I was your son. MAX: You are my son! She didn't know a thing about it, you just got hold of the wrong end of the stick, that's all. Look, Danny, we've been through all this before. What your mother did...it's all over and forgotten. A few weeks ago you believed I was your father. I mean, in some ways I'm glad you know the truth. ...Look, nothing alters the fact you're my son. As much as Shane is. DANNY: I'm sorry, Dad. It just takes a bit of getting used to I guess. MAX: Yeah...yeah. She takes a bit of getting used to as well, eh? The removal men have just finished. Des comes over - it turns out he knows the removal man as he arranged a loan for him. REMOVAL MAN: I owe you a favour for fixing up that loan. Think seriously about selling up and moving away from here fast. House values are going to drop like flies. But Max has come out of his house, so the removal man decides to make a sharp exit. Max grills Des for details about the new neighbours. Eileen and Daphne are practising the wedding march - Daphne is wearing a pale pink dress. Eileen starts to cry with happiness, but is sad that they're only going to have a small ceremony. Des comes back and Daphne quickly rushes into the bedroom since it's bad luck to see the wedding dress. Des and Eileen sit down. Des tells Eileen that he doesn't really want a small ceremony, but Daphne insisted on it. He tells Eileen to keep her nose out, though. Eileen decides to go home, offended. DES: No wonder my old man shot through! I just wish we could have kept quiet about this wedding until it was all over and done with. DAPHNE: Oh, Des. Look, there is no way in the world you're going to get out of marrying me. In two weeks' time we'll tell the whole of Ramsay Street that we're Mr and Mrs Clarke. Des tells Daphne that they've got some new neighbours - and apparently they're not good people. Max is standing outside No.22, pondering. Danny joins him. DANNY: How long is Aunty Madge going to stay, Dad? MAX: Another eighteen hours and forty-five minutes. Max is determined that Madge is only staying for 24 hours - then she's out. 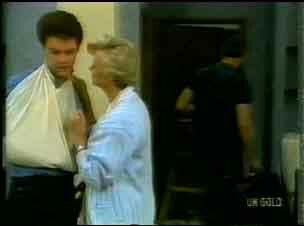 PAUL: Well, Gran, that's what you get for falling in love with the wrong sort of people! HELEN: Yes, but there's no point being bitter about it. The only person you hurt is yourself. PAUL: Are you referring to me or you? Helen tells Paul he can be rude to her and Jim, but not to Lucy. HELEN: That little girl's been fretting ever since they took you off to hospital. She prays for you at night. I won't let her be hurt. PAUL: Can you just tell her I'm a bit screwed up at the moment? HELEN: No. You tell her. Paul joins Lucy, who is sitting on the front steps. They chat about Scott. Lucy is very subdued and Paul apologises for snapping at her when he came home. PAUL: Ever since the...accident, I just get a bit mean to people sometimes. I'm sorry. LUCY: I know you never want us to mention Terry again, and I know she hurt you. But we all loved you long before you met her, Paul. LUCY: I suppose if you really love somebody, it doesn't really matter if they get a bit mean sometimes. Especially your favourite brother. She hugs him, but then Paul gets up and goes back into the house. A young guy comes into the Coffee Shop. 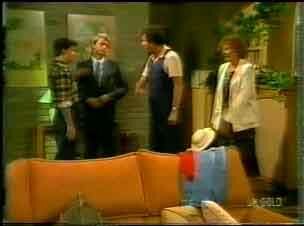 He speaks to Daphne and tells him that Scott Robinson sent him to see about a job. His name is Mike, and he has some experience working in cafes. Daphne gives him an evening job and he offers to start straight away. Just then a woman rushes in and hugs Daphne - it's the same woman who pickpocketed Shane at the airport. Daphne's not having any of this and quickly gets the woman in a head-lock. DAPHNE: What the hell are you doing here! WOMAN: Doing here? What else would I be doing here, I'm here to see you! DAPHNE: Good. Now you've seen me - beat it! DAPHNE: Shoot through, get lost! WOMAN: That's not exactly friendly, Daph! DAPHNE: Right. Mike - get the police.